The Ottawa Senators were founded in 1883 as the Ottawa Hockey Club (Ottawa HC). Before joining the National Hockey League as a founding member in 1917, the Senators spent time as a member of six different hockey leagues. From 1920 to 1927, the Senators were known as the “Super Six” Senators and are considered to be the NHL’s first dynasty. The club won four Stanley Cups and finished first in the regular season seven times. The franchise announced after the 1934-1935 season that the club’s financial losses over the last two seasons were too high, which forced the club to be moved to St. Louis where they became the Eagles. The St. Louis Eagles then only lasted one season before folding forever. The ’25-’26 Ottawa Senators were the 7th seed in the inaugural Ultimate NHL Playoff and had a 1st Round bye due to their multiple Stanley Cups. In the 2nd Round, they were eliminated in seven games by the 39th-seeded ’78-’79 Atlanta Flames, who were the inaugural tournament’s Cinderella. LW – Cy Denneny – A member of the 1959 Hockey Hall of Fame class, Denneny was arguably the greatest goal scorer of his era. In fact, in terms of goals-per-game, Denneny ranks among the best to ever play the game. He scored 248 goals in 328 games for a 0.756 goal-per-game rating, which is 2nd in NHL history to only Mike Bossy. G – Clint Benedict – Benedict was voted into the HHOF in 1965 after winning two Stanley Cups and leading the Senators to five appearances in the Stanley Cup Final. He spent seven years as the starting goaltender for Ottawa. G – Alec Connell – The original Senators were very lucky to have Benedict as a starter for so many years as he was seen as one of the best goaltenders of his era. Fellow Hall of Famer, Connell replaced Benedict in 1924 and only went on to win a Stanley Cup of his own with Ottawa. He also posted the lowest career goals against average for a goaltender with at least 200 career starts in NHL history at 1.91. The tournament begins Monday! 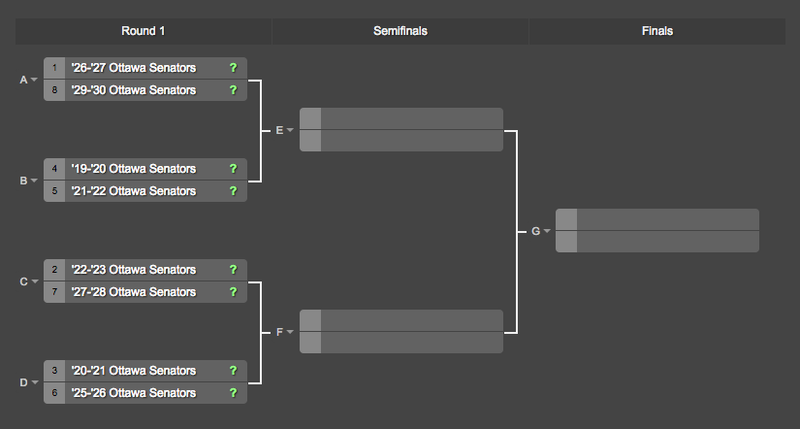 The 1st Round will carry over into Tuesday and the Semifinal will take place on Wednesday with the Final on Thursday. This entry was posted in Qualifying Tournament, Ultimate NHL Playoff and tagged Alec Connell, Clint Benedict, Cy Denneny, Mike Bossy, Ottawa Senators, Qualifying Tournament, Ultimate NHL Playoff. Bookmark the permalink.